Are you needing Air Conditioning Repair Los Angeles services ?The air conditioner is an essential part of many homes mainly in the temperate regions or during the summer heat wave. Keeping cool when indoors becomes a priority for most homes during this period and even though Fans help to regulate temperature, taking out hot air and gushing in cool air, there is a limit to its effectiveness in the more humid areas. This is where the benefits of using an Air Conditioner comes to fruition. It can continually keep your house at a specific cool temperature for an extended period. There are two popular types of air conditioners. The central air conditioners and the room air conditioner. The central air conditioners have two separate components: the condenser and the evaporator. The condenser unit is usually located outside the house on a concrete slab. The evaporator coil is then mounted on the main duct junction above the furnace. When a central air conditioning repair Los Angeles services are needed by West Coast. Be sure that your ac is running, hot air in the house flows through the furnace through the return-air duct. This warm air is moved by the blower over the cooled evaporated coil in the main duct junction and is then delivered through tubes to make the house cool. If the air conditioner is working but not cooling, then there is a problem in the distribution system. The room conditioners for Air conditioning repair Los Angeles services to be needed. Some other ideas may be window units, work almost like central air conditioners. They are smaller than central systems and costlier to operate. Typically, room units are built to cool only the room which they are located, they barely cool surrounding rooms. The compressor, fans (two of them), a motor, and thermostat controls are sandwiched between the coils. The biggest problem with window air conditioners is the dirt and dust that it attracts. This debris reduces the speed of the fan that blows air, and block the filters and drain ports. There are many causes of failures of an AC ranging from electrical to mechanical faults. Dust clogging or electrical mishap could result in the breakdown of your AC. There are fundamental fix procedures that you can go over and here I will be giving some air condition repair information. The electrical power unit of the AC should be switched off before any repair work is done. 1. Check the Furnace: first, set the thermostat to A/C mode, then lower the temperature setting. If the furnace still kicks in, then the problem is not from the furnace. If the fan fails to run, reset the furnace circuit breaker, and if the fan still didn’t start, then it’s a more complicated issue. Then check the outer condensing unit, the compressor and fan should be running. If not, there are other options to consider. 2. Change the Filter: The filter of an air conditioner helps it stop dirt from getting into the air conditioner system. But then, most people let it become too dirty, and this is a huge cause of poor performance of the AC. A dirty filter adds resistance to the fan and reduces air flow. Check and clean your filter if dirty. 3. Check the Coil: apart from the air conditioner, there are other flow problems that you could encounter with the Air conditioner. When the evaporator coil is dirty, limited air moves across it, and then it reduces the cooling ability of your home. Your condenser coil is dirty, it won’t dump enough heat to the outside of the house. If other obstacles cover the coil, it is important to clear it out. To properly clean it, use a soft brush to dust off the coil, then spray the coil with no-rinse coil cleaner. The spray will foam up and then drop into the drain pan. To keep the drain clear longer, place a drain pan tablet in the pan. 4. Check the Ducts for Disconnection: Many homeowners tend to ignore the ductwork even though it is as important as any other part of the cooling system especially since most ducts are left outside the house. If the tubes of the Air conditioner are outside, check to see if any of the connecting pipes are loose. Just by fixing a supply duct that has been sending all its cool air to the wrong places can cause an immediate improvement in the working of the Air conditioner. Another bad effect of leaks in the ductwork is that it makes the air conditioner work much harder to provide enough cool air for the whole place. This leads to overworking of the system and potential mechanical failures. 5. Clean and Repair the Coil Fins: The fins of the air conditioner also get dirty quickly. Remove the outer covers and brush off the dirt, then spray through the fins from the inside to the outside using a garden hose. You can use fin cleaning spray but never use a pressure washer. Also, the fins on the evaporator and condenser coils can easily be bent, and this obstructs airflow through the coil. You can get a fin comb from a wholesaler or some big retail shops to brush these fins back to the original positions. 6. Inspect the Window Seals: For room air conditioners, it is important to regularly inspect the window seal between the air conditioner and window frame to ensure it’s in contact with the metal case of the AC. Moisture can be a cause of damage the seal, and this allows cool air to leave the room thereby overworking the AC and causes faults. It is a vital HVAC Repair Procedure. 7. Check for Electrical Faults: This is one option that I tell owners to be mindful of. If you have done the mechanical repair and have not yet identified the fault, see a technician. But if you are sufficiently skilled, there are electrical faults you can try to check. • Replace the contractor. This is a relay that turns on and off some units. • Check the fan motor if it is running correctly. Finally, check the refrigerant/coolant to make sure it is sufficient. 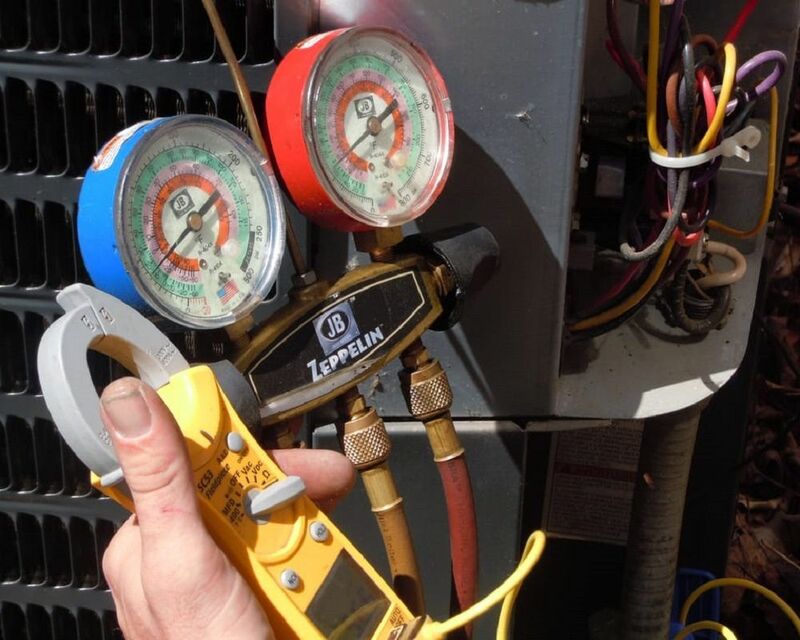 After these checks, then a professional air conditioner expert should be met to have a first-hand look at your system. When you need Air Conditioning Repair Los Angeles call us today.